Located within The American Club, this grand dining room is a special-occasion tradition among those seeking substantial all-American fare. : Stately antique chandeliers, leaded glass windows, Baker furnishings and country club-worthy floral draperies don’t reveal that this serene, wood-paneled dining room was the original dining hall for immigrant workers from the Kohler Company. 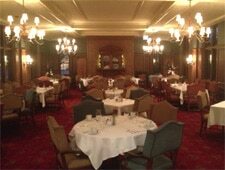 But gussied up guests seem to appreciate the history of the hotel-centered dining room nonetheless. As for the menu, it’s all-out Midwestern, done gourmet-style. Appetizers, or "Wisconsin Beginnings," include salmon, bison, duck, beef, venison, cheese and sturgeon-based finds. Among entrées, we like the Wiener Schnitzel Holstein with herbed spätzle, roasted asparagus, fried egg and sage brown butter sauce; and the potato-crusted walleye with shrimp mousseline, fennel, capers, tomato and Pernod beurre blanc. For dessert, savor the red wine apple tart with green apple sorbet and red wine caramel sauce, or sample your way across a plate of Wisconsin cheese. Afterward, retire to the elegant Library Bar for an apéritif. In-the-know diners also come for the luxe Friday night seafood buffet and Sunday brunch.